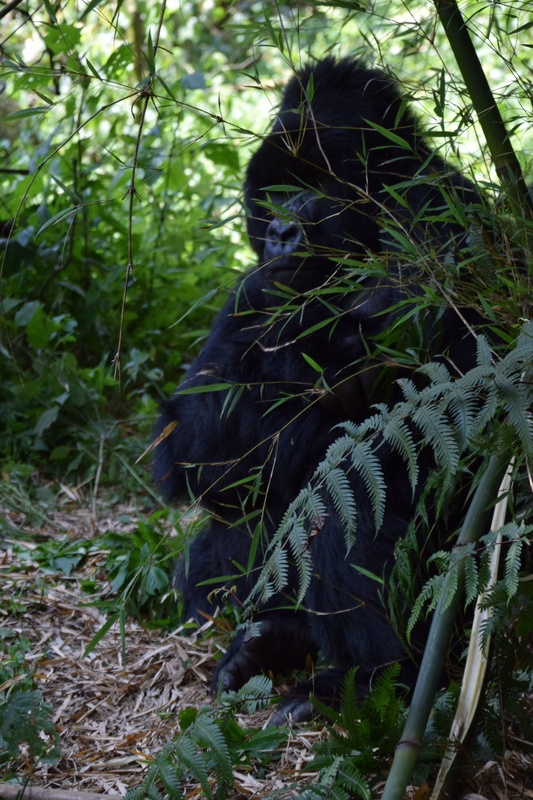 In 2013, 266 New Zealanders visited the gorillas in Rwanda. Today we get to be one of the few in 2014. A civilised 6.30am pickup from our lodge. Closed shoes, check. Garden gloves, check. Raincoats, check. We arrive at ParkHQ… The car park is filled with dozens of 4wd vehicles. 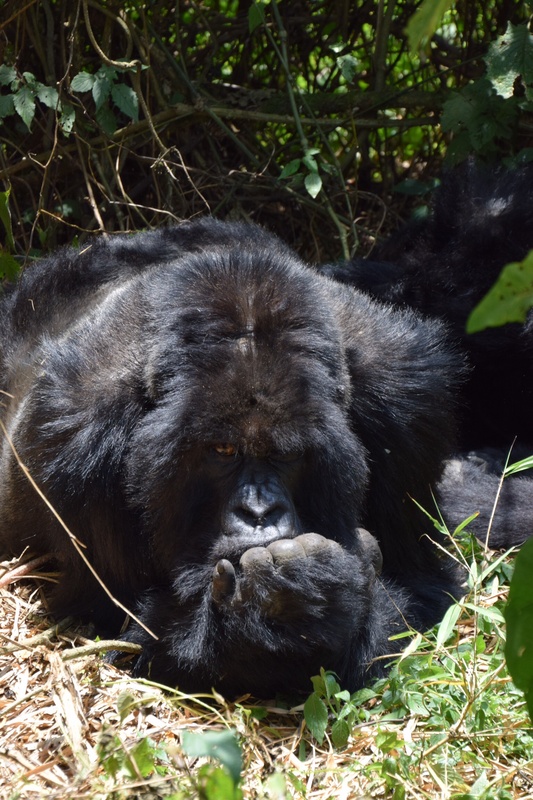 Each day, just 80 tourists get to see the gorillas – in groups of 8, visiting one of the 10 gorilla families that has been habituated to tourists, for just one hour (strictly enforced). 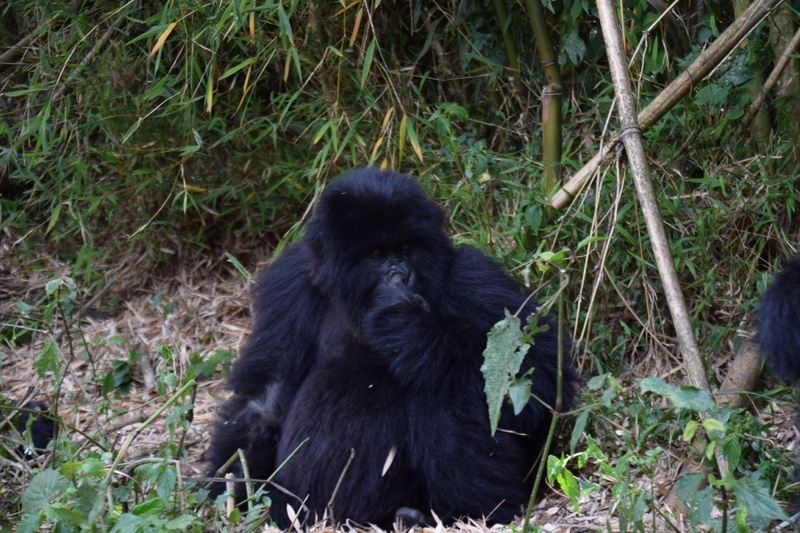 There are another 8 groups of gorillas reserved for research purposes, never visited by tourists. The gardens of ParkHQ are thronging with people. An African song and dance performance I’d in full swing, drivers are running around registering their tourists, guides are sussing us all out, a group of local primary school children arrive – they’re being taken to see the golden monkeys, to educate them early. Coffee with cremora… Memories! You can tell the Americans – they’re the ones in the designer trekking gear (though to be fair, that type is in the minority). Most are just like us – seasoned travellers. 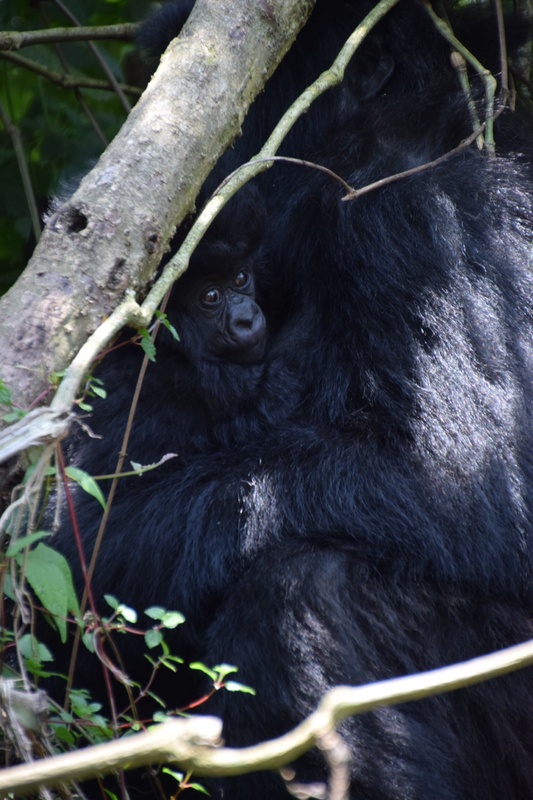 In fact, what really stands out about a Rwanda is that there are almost no novice travellers – we have never been in such experienced traveller company! It’s like a third world trading floor down there on the lawn as the haggle about which tourists are going with which guides to which gorillas. 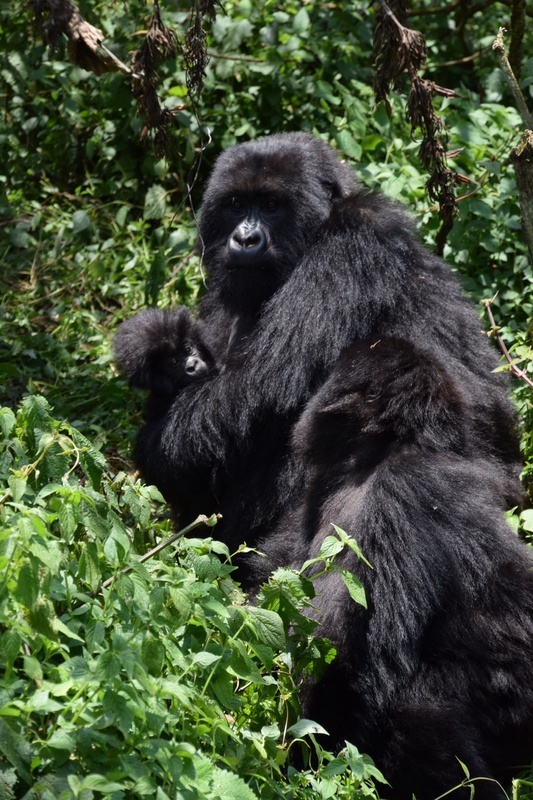 The options range from short and easy (3hrs there and back, plus your hour with the gorillas), up to a major trek of 8 -10 hours round trip. 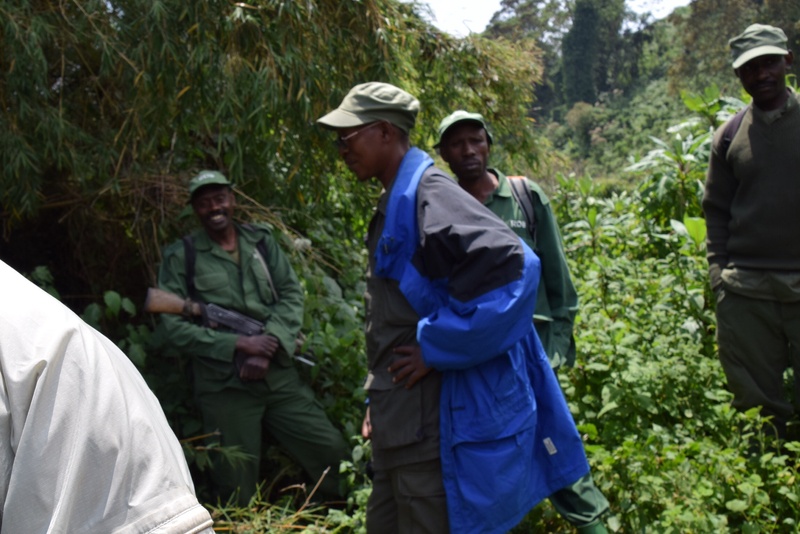 Emmanuel looks pleased as punch… He has secured us a moderate walk, with the head of guides (Felix has been working with the gorillas for 28 years here and in Uganda), assisted by Francois, to whom he defers as the most experienced guide, with 37 years experience. He is honestly more monkey than man. A bone crunching 45 minute drive to the start of our 2 1/2 hour trek, porters eagerly awaiting our arrival. We are encouraged to take a porter, even if we don’t need one… And I must say our man Peter (coincidentally) was invaluable in not only carrying our backpack, but particularly in taking me by the hand on the difficult bits of the hike. 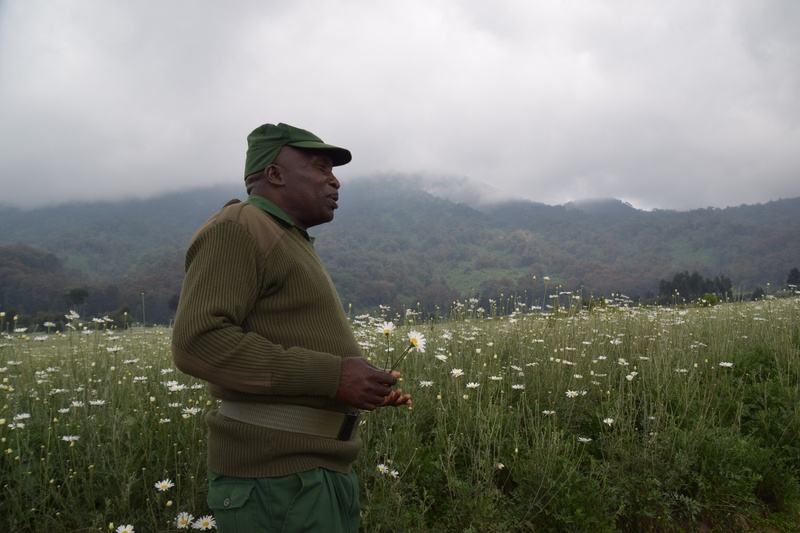 We hike first through village farmland on the edge of the park – mainly potatoes which love the rich volcanic soil, and pyrethrum daisies, a cash crop used as crop rotation. An hour in we are met by a trio of armed guards at the low stone wall that surrounds the remaining 120 sq km of National Park. The AK47s are, we’re told, coming with us in case we meet the buffaloes – and there’s certainly plenty of evidence of buffaloes on the trail, and even occasional elephant dung. Not that they actually shoot the buffalo, we’re told – they scare them off by shooting into the ground. The hike is challenging in parts – particularly the steep parts, fringed with stinging nettles. Then, suddenly, we’re there… A bunch of park trackers appear in the clearing. 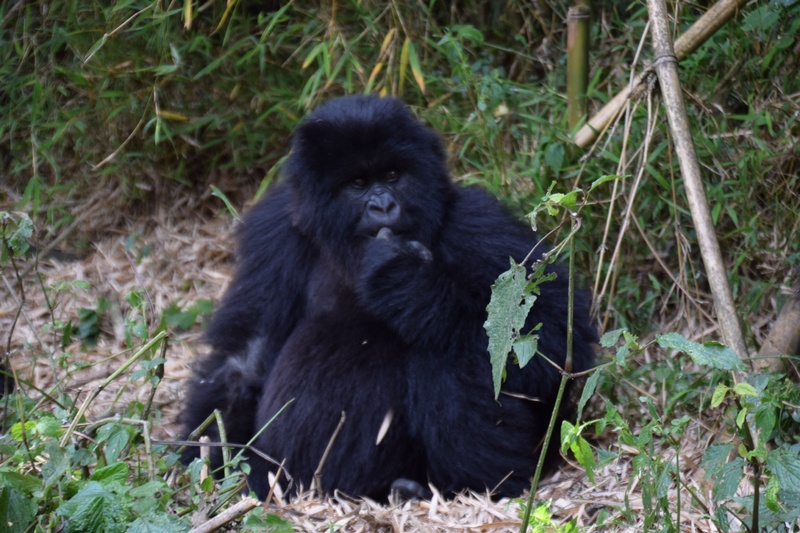 They’ve been tracking our gorilla group, and have led our guides to them. 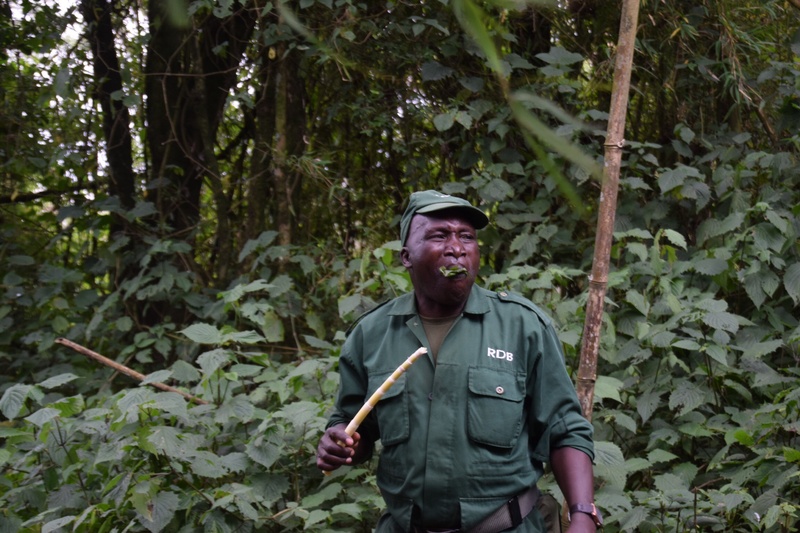 We dump the bags, the walking sticks, all food ande water… Taking only ourselves and our cameras, we head through the bush to find ourselves literally in the midst of the gorillas. At this point, crazy French woman in our group, on her 10th visit to the gorillas, with her body covered in tattoos of those she’s seen before, discovers that the giant lens on her camera, that needs a full body harness for her to carry, is going to be completely useless unless she’s planning to take their fingerprints! 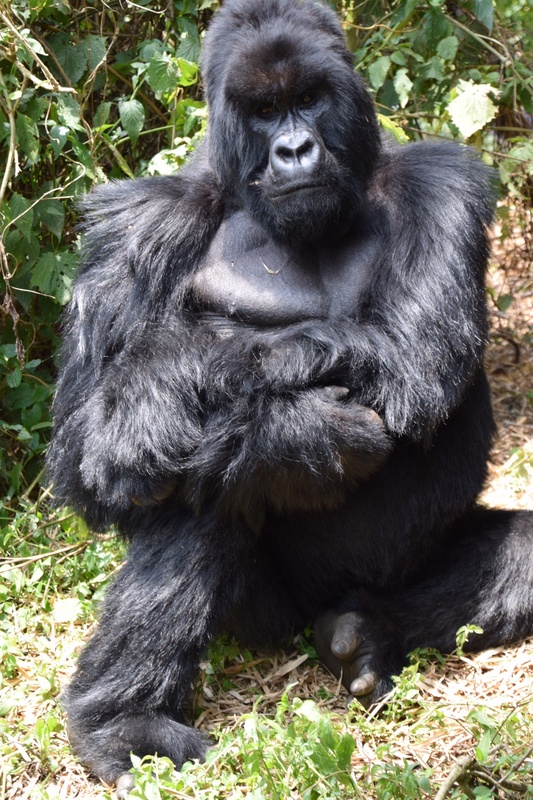 We are standing less than 3m from the alpha male, the number one silverback in a family of 20 gorillas – Amohora – that has 5 silverbacks (mature males) amongst them. He is huge. He looks at me, rises slowly and starts walking towards me. Crouch down, stay calm, says Felix. Francois meanwhile is communicating with the group in “gorilla”. They talk back, they clearly know him. I crouch down. Stop clicking the camera. He brushes firmly past me, strong and soft. Almost past, a quick flick of his hip, and his back foot pushes me over. I am more amazed than afraid. Awed, really. He settles in his new spot, head resting on hands, thinking…. A pregnant female suns herself, resting in the clearing. She’s 8 months pregnant, one month to go. She looks uncomfortable. 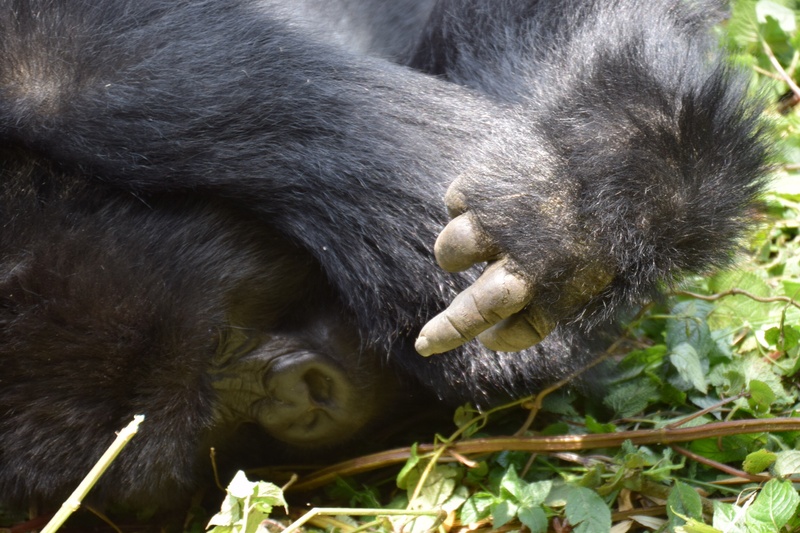 We wander further into their resting place… Gorillas everywhere, within reach. Juveniles playing the trees. A mother determined to hide her one month old baby from us, but every time she tucks him in, his little inquisitive head pops out, determined to see what’s going on. Our group is mostly focused on getting the perfect photo. 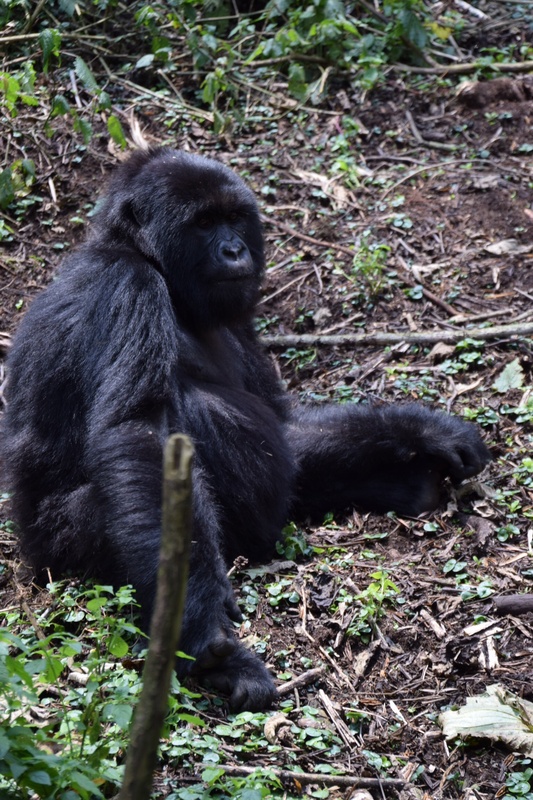 Peter is just happy to sit and watch – though when I force him to sit so I can get him and a gorilla in the same shot, he ends up kneeling in a patch of stinging nettle! Sorry Peter! Our time is almost up – how fast an hour flies. We are mesmerised by a family group. Young one being weaned is carried by daddy, mother following on behind. The care for his son is clearly visible on the father’s face, and in the way he gathers him up protectively to prevent him from straying too close to us. They are part monkey, but very much part human. Visiting them is incredible. An experience beyond words – and to have done so under the tutelage of a guide who is so very much part of their family gave us even more insight into their habits and their lives. 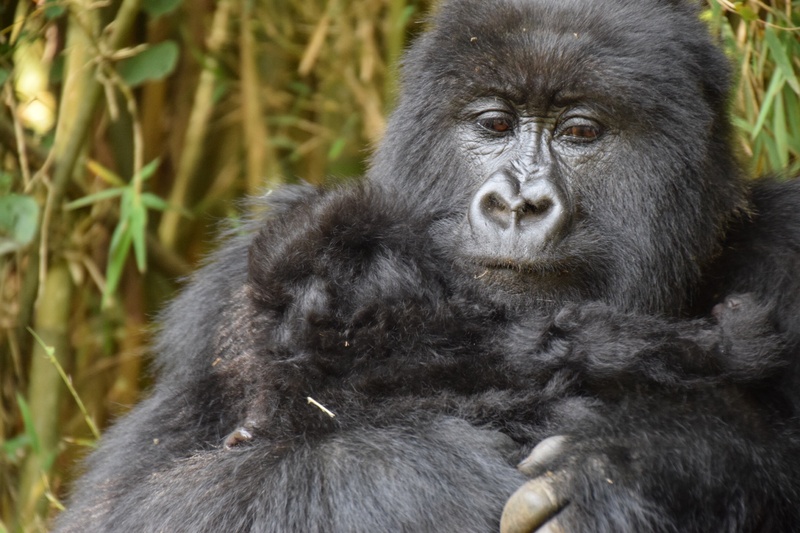 Each year, thousands of people gather for a naming ceremony, where they name all the babies born that year – the gorillas, of course, do not attend. But when a gorilla dies, the guides bury him in one of two gorilla cemeteries – those who knew Diana Fossey are buried with her, at her memorial, the others near to ParkHQ. 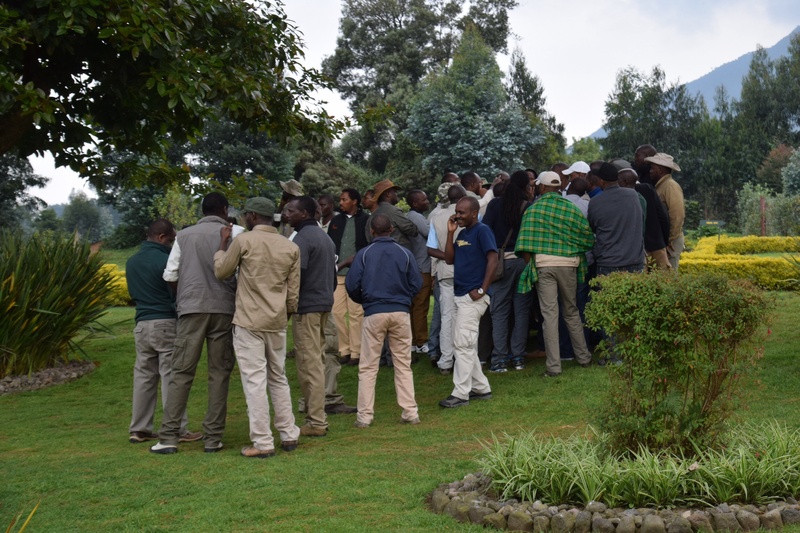 These are people who care deeply about the gorillas, and from my viewpoint, that care was clearly reciprocated. ← The roads of Rwanda… I take it all back!